The Sporting News Magazine or TSN is the longest running periodical dedicated to sports today. It began its' long history in 1886 in St. Louis, Missouri, by editor and publisher Alfred Spink and became known as "The Bible of Baseball." It wasn't until after WWII that TSN started reporting on other sports including Football, Hockey, and Basketball. Vintage Sporting News back issues are very collectable. Collectors love the history and lore of years past contained within the pages of the old Sporting News Back Issues. In 1964 The Sporting News Magazine began using a cover photo of a different sports player each issue and by 1969 all the covers were in color. Mailing labels were not attached to the newspaper until November 1981, making the early issues desirable by collectors. Values of The vintage Sporting News back issues vary greatly. The old Sporting News Magazine issues are obviously more valuable due to rarity and the conditions are usually not as nice. The old Sporting News back issues that were published during baseball season include boxscores and game synopses and are generally 25% higher than off season issues. 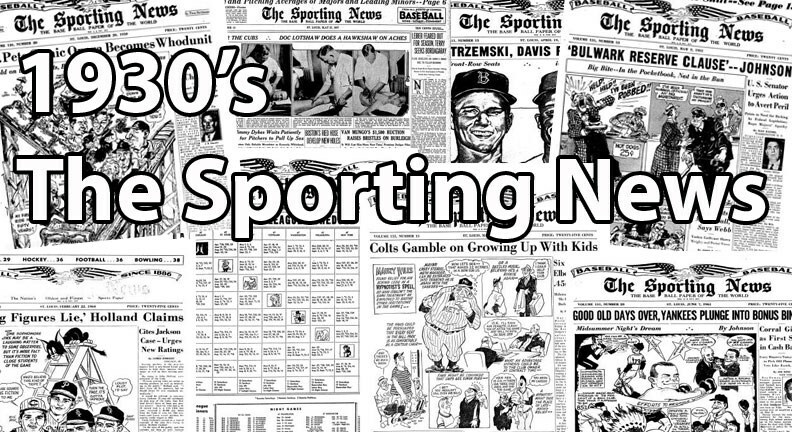 Click here to read more about The Sporting News issues from the 1930's! CLICK HERE if you want to sell your 1930's Sporting News cards.